Last week I had Carla Caruso on discussing the superstitions around Halloween, which I thought was fascinating. I always love learning about things like that, the origins of belief and how they have come into being. I always try to weave a little bit of this into the make-believe worlds in my novels, because I think it adds something of the human experience to what I create out of my own little mind. 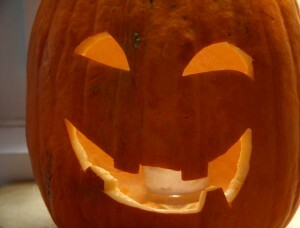 Dark Moon is set around Halloween, or Samhain as it is known. The eve the veil opens between worlds and the dead can be seen. The time I chose to set it was essential to the plot and the build toward what happens – in a way, Samhain is as much a character in the plot as the other secondary characters. I love to share this fascination with mythology, legends and superstitions with my children, to help encourage their imaginations but also have an understanding of the world around them however it comes. To expand their minds and keep them open to new ideas – or ancient ones. Many people say that Halloween is an American thing, that it’s commercial, a reason for businesses to make us buy stuff that we don’t really need. As we discovered from Carla last week, this isn’t true. Maybe it means this to many people, which is why they resist the fun of it, but at heart it is an Irish tradition based in Paganism (you can read all about that here), a celebration of harvest, of beginnings and endings, a tipping the hat to those past and an acceptance of all life has to offer. There are some lovely mysticisms and stories woven around the traditions of Halloween, of the carved pumpkins and the reason we dress up. 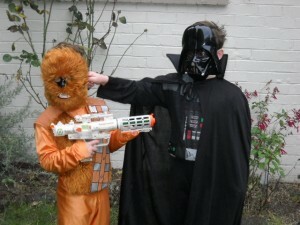 But for me, Halloween is also about the gorgeousness of make-believe. Of pretending unreal things could be real. Of looking into mythology and seeing fun and life and meaning. Of expanding imagination and having FUN. Yes – the ‘f’ word – Fun. 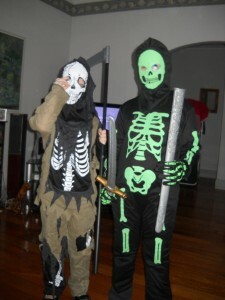 I love Halloween because for that one night, kids and adults can dress up and walk the streets together in friendship and the spirit of exploration and enjoyment. 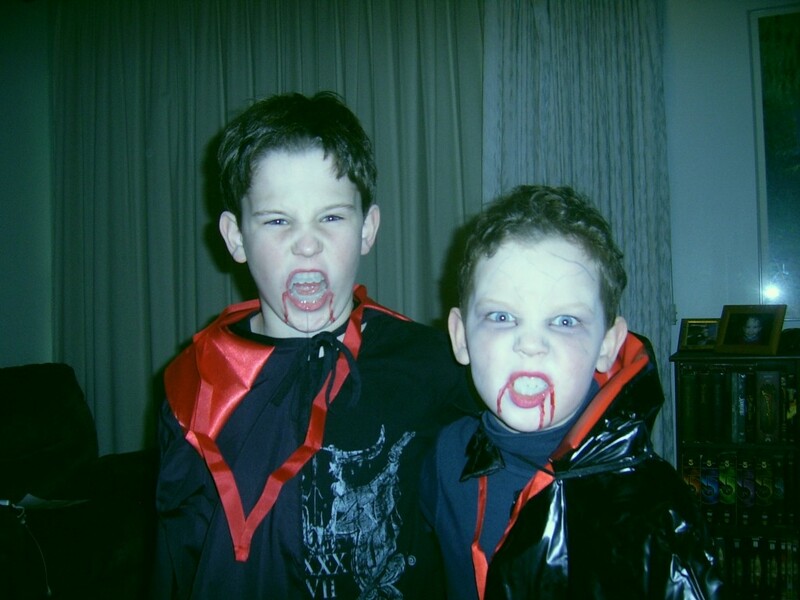 Yes, there is the whole trick or treat thing, with the expectation of lollies. But for me and my kids, that’s not the most enjoyable aspect of the night. It’s meeting others who have taken the time to dress up and have fun with make up and costumes and make-believe, chatting with strangers and hearing exclamations of delight (or horror as the case may be) of those who open their doors. It’s also about my kids understanding choices and that everyone is entitled to theirs; that just because someone hasn’t joined in by greeting them with lollies at the door, doesn’t mean anything other than they just don’t want to. Or that they have other beliefs that don’t include celebrating All Hallow’s Eve. Which is A-Okay. (both his choices). My eldest doesn’t like the make-up, but the youngest LOVES it as much as me (lucky for me). This year, the youngest has decided to go as a Zombie. 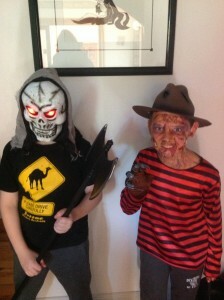 And not any pale skin, black lipped, black eyed zombie most kids go as. He wants the full on desiccating zombie effect. 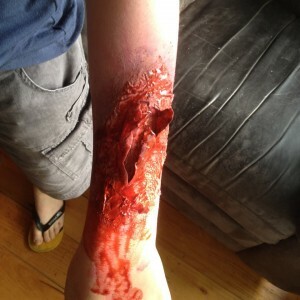 And so I have watched YouTube videos on how to do the zombie ripped skin effect. If you have the right equipment (mainly liquid latex, tissues and an array of costume make-up colours and of course, facke blood and lots of it! ), you can create quite realistic effects. 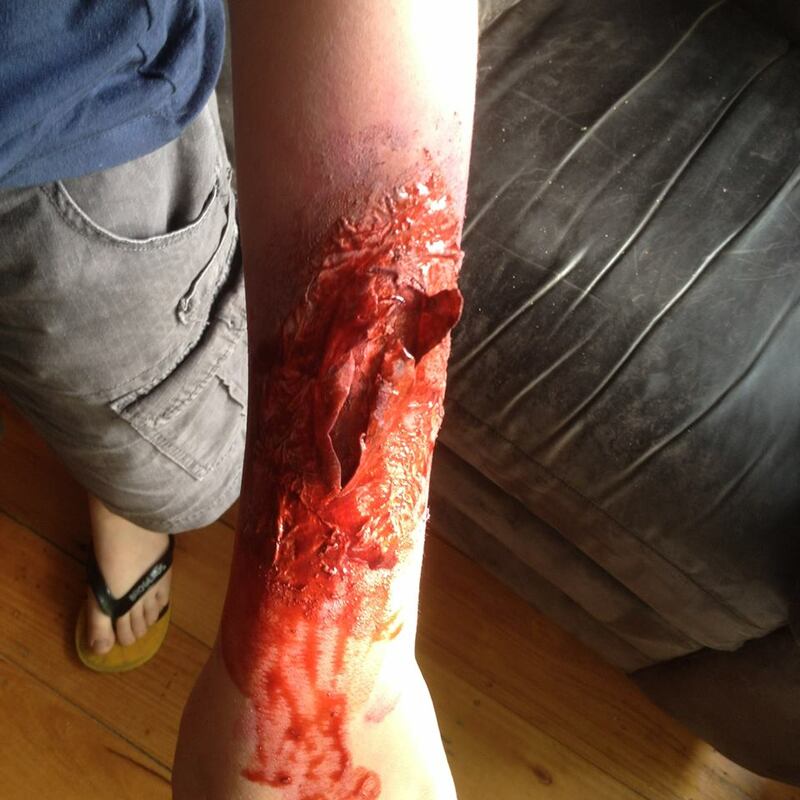 I did a test run on my son’s arm the other night – what do you think? For a first try, I don’t think it turned out too badly. Perhaps a little more blue for a bruised skin effect around it, but it was quite easy and didn’t take too long either. So, on Friday night, I will be doing Zombie make-up on my son and his cousin – and if I’ve got time, I might do up my sister and me too. I even bought some white contact lenses to give that truly ‘crazy walking dead’ feel. I’m going to a friend’s 40th birthday afterwards – it might just be fun to turn up as a zombie. And it might just give me a chance to share a little bit of the mythology of Halloween and zombies with other people if they’re interested. Can’t wait. Celtic Festival! Don’t forget the Welsh. It’s Nos Galan Gaeaf over there. What a great name. Thanks for letting us know, Liz.